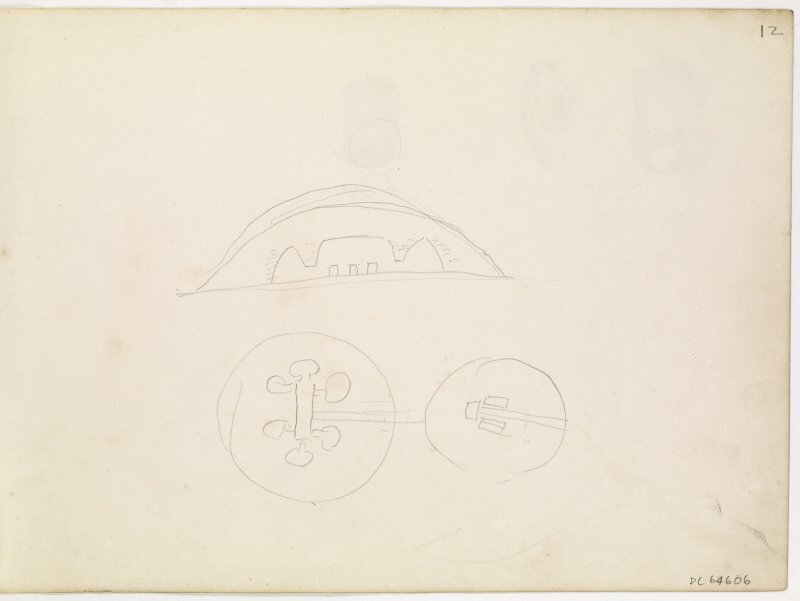 Plan and sections of Quoyness chambered cairn. 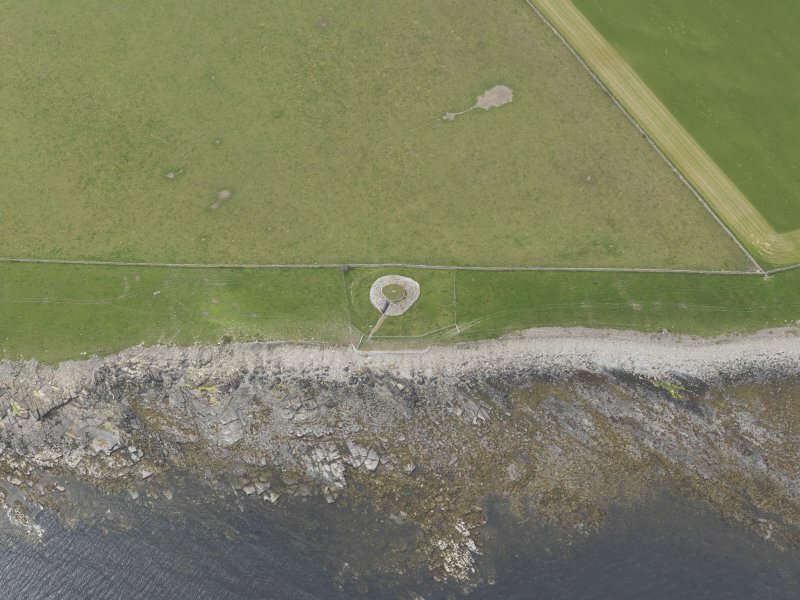 Oblique aerial view centred on the remains of the chambered cairn, taken from the ESE. View towards entrance of reconstructed chambered cairn. 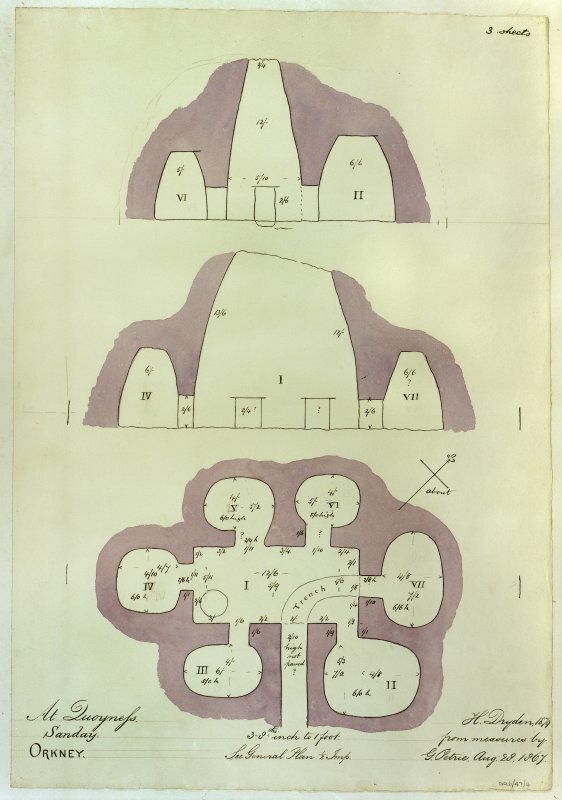 Plan of Quoyness chambered cairn. Drawn by H Dryden 1879 after G Petrie 1867. 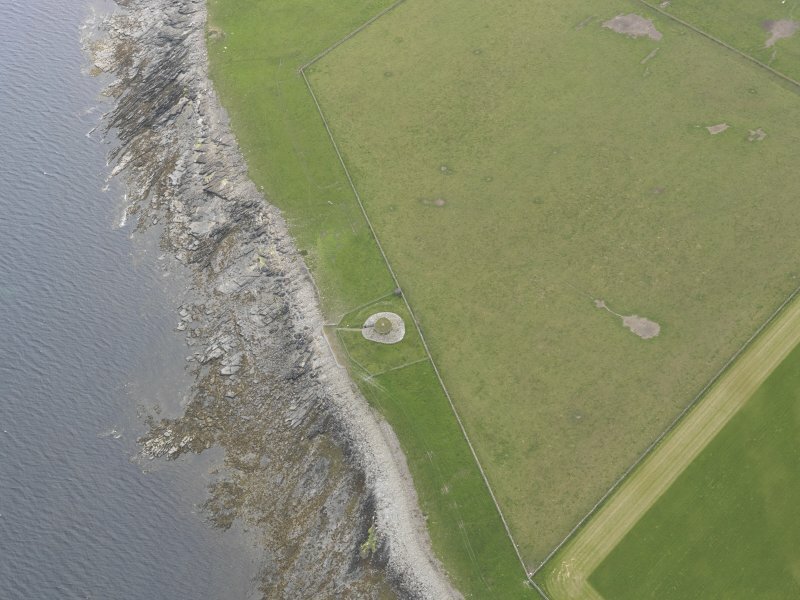 Oblique aerial view centred on Quoyness chambered cairn, looking SW.
Plan of Quoyness chambered cairn. 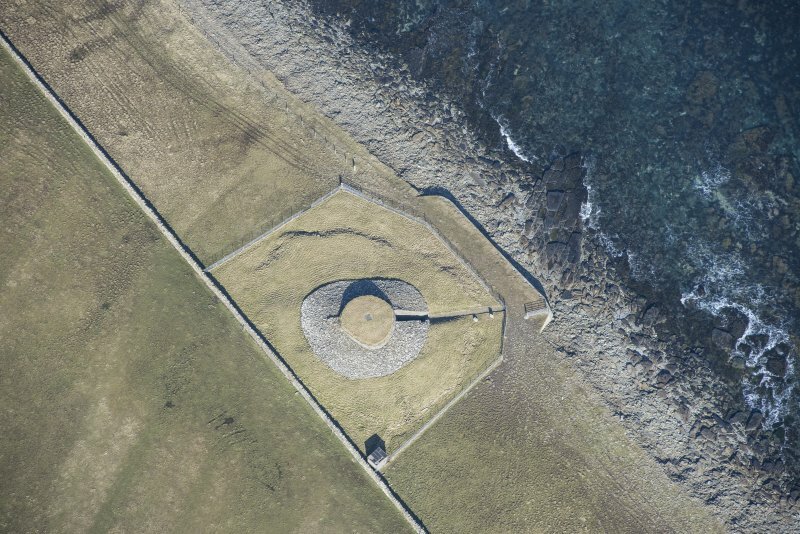 Oblique aerial view centred on Quoyness chambered cairn, looking SSW. 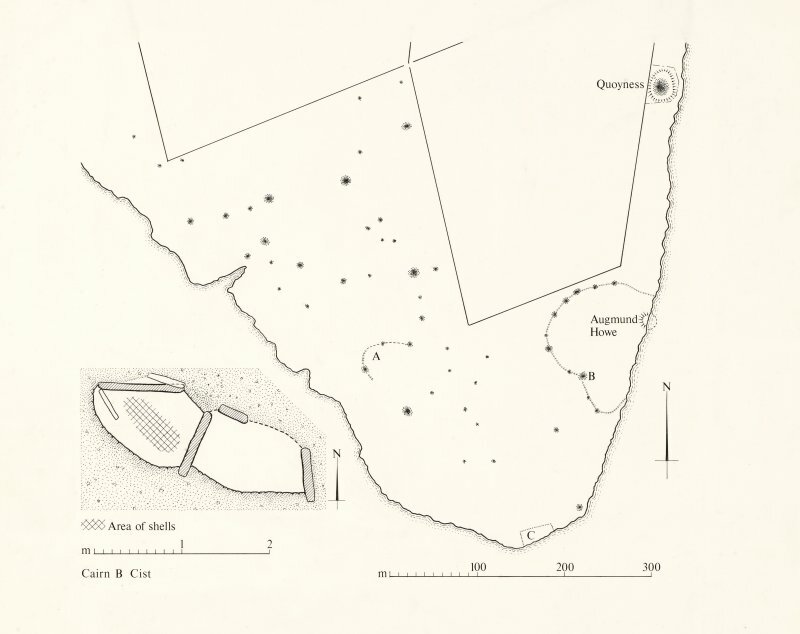 Sections through Quoyness chambered cairn. 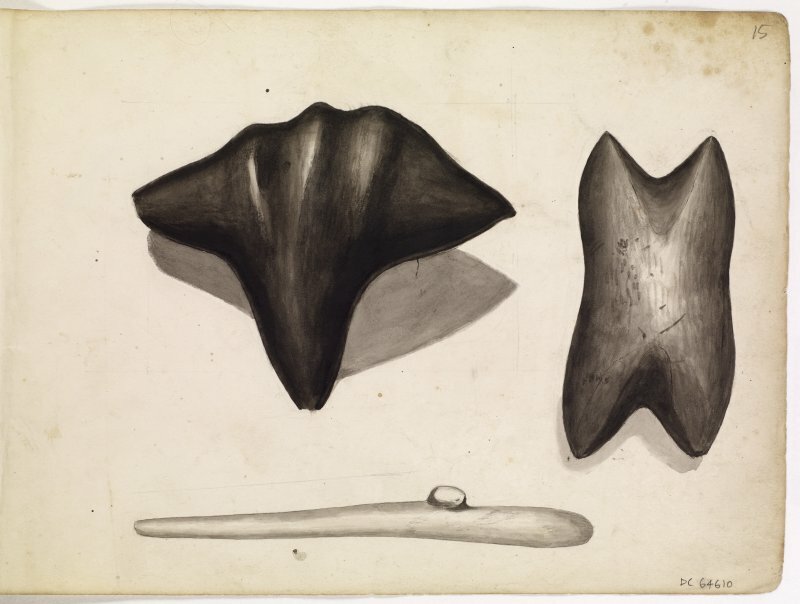 Drawn by H Dryden 1879 after measures by G Petrie 1867. 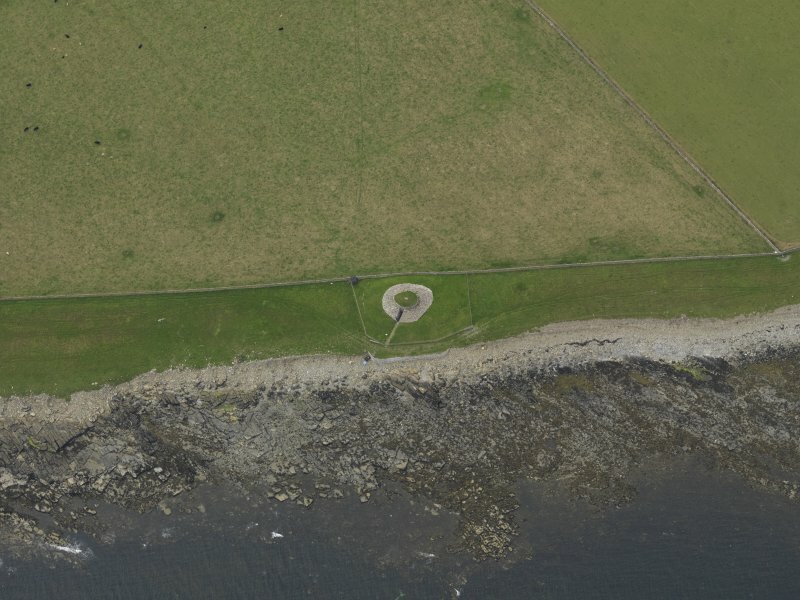 Oblique aerial view centred on the remains of the chambered cairn, taken from the NW. 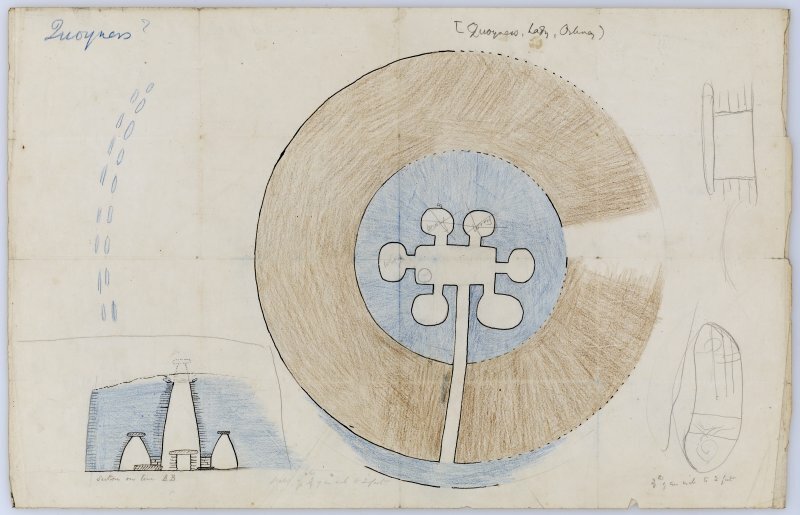 Sketch showing plan and section of Quoyness chambered cairn, Sanday. 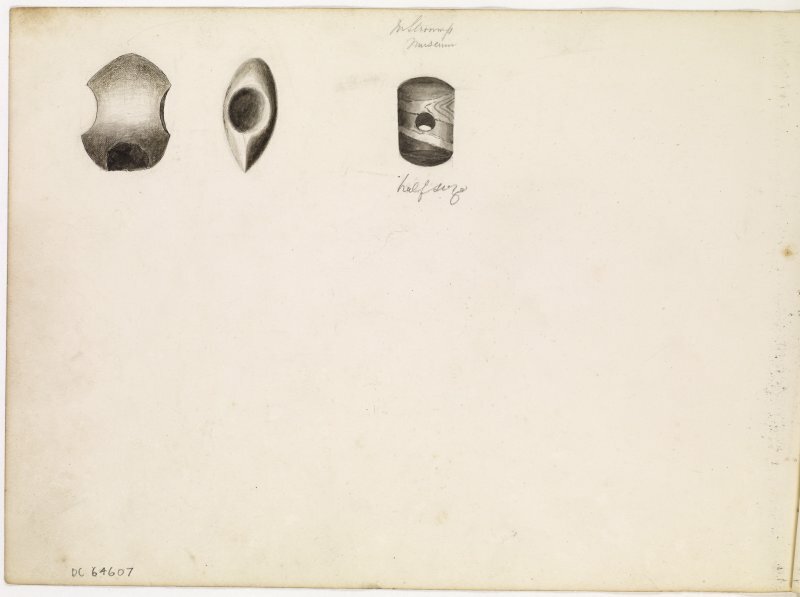 Drawings of maceheads from Quoyness chambered cairn, Sanday, in Stromness Museum. 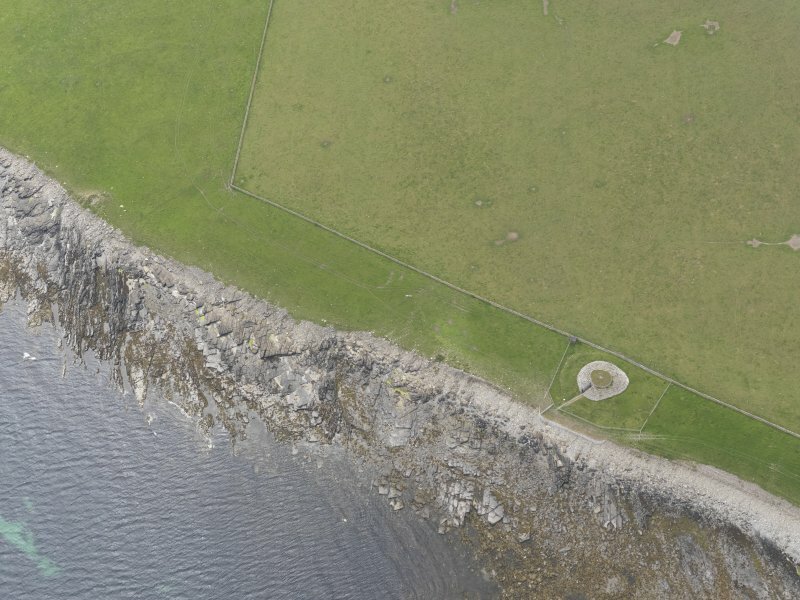 Oblique aerial view centred on Quoyness chambered cairn, looking W.
Drawing showing artefacts from Quoyness chambered cairn, Sanday. 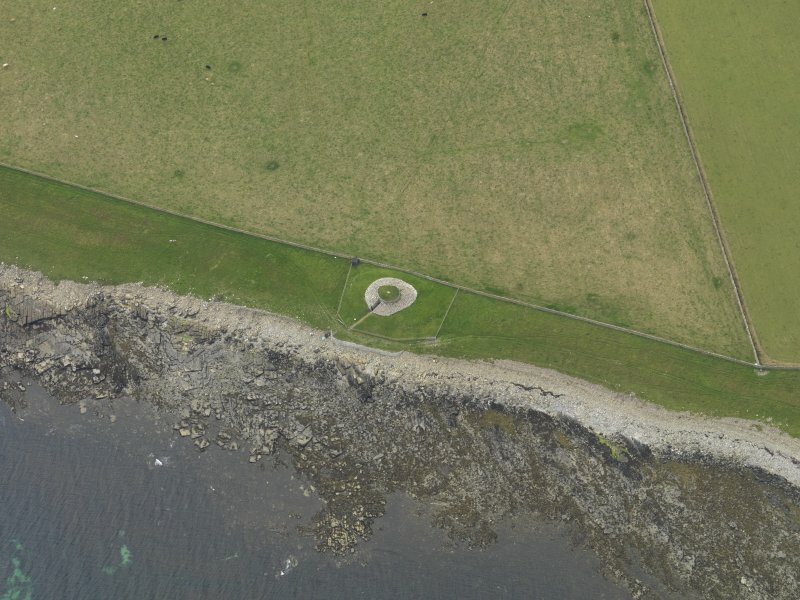 Oblique aerial view centred on the remains of the chambered cairn, taken from the ENE. OS 6" map, Orkney, 2nd ed., (1900). 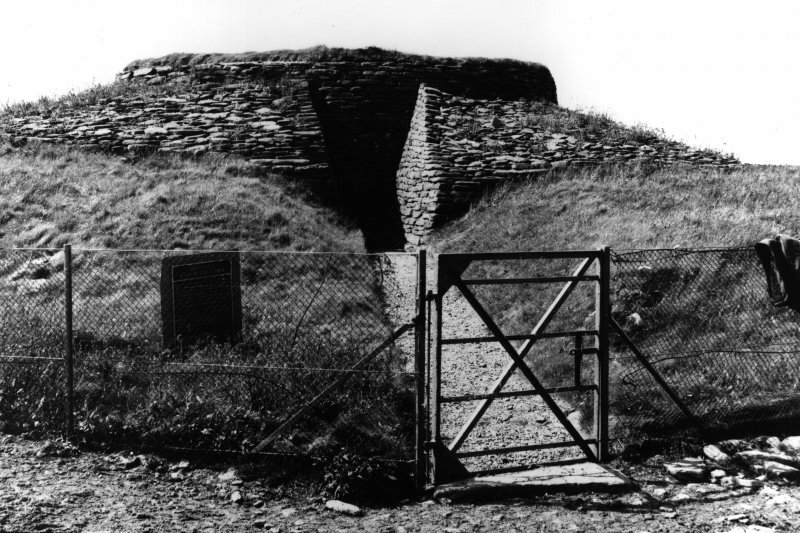 A Maes-Howe-type chambered cairn, measuring 67' by 56', the intact chamber being enclosed within a complex cairn and surrounded by a platform. 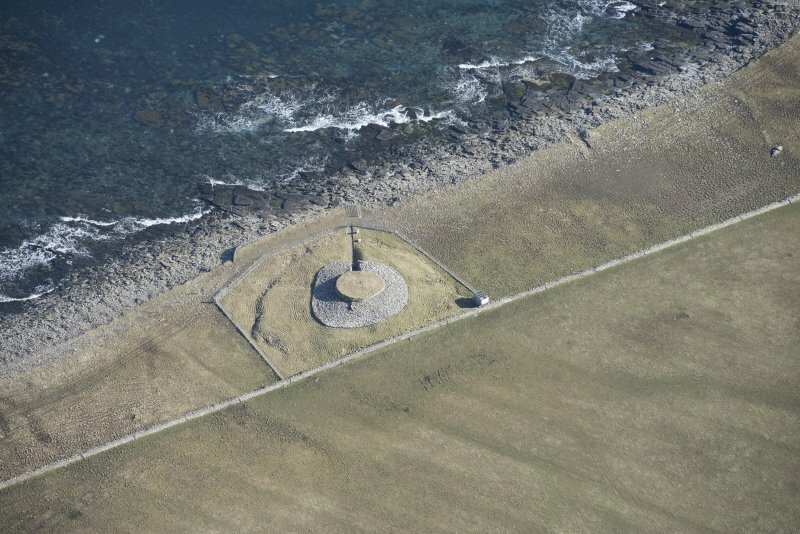 It was excavated by Farrer and Petrie in 1867, in the belief that it was a broch, but was subsequently recognised as a chambered cairn and re-excavated by Childe in 1951-2 for the MoW in whose guardianship it has been placed. 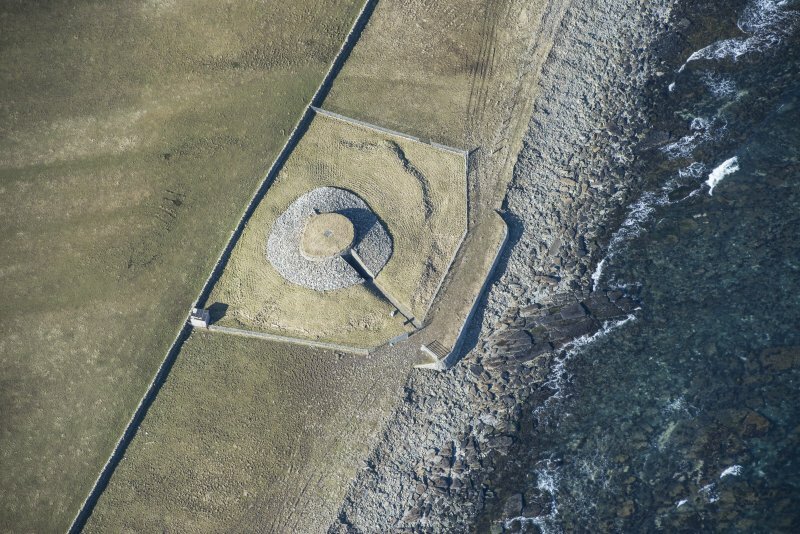 The roughly rectangular chamber, with six cells, is enclosed within an ovoid cairn, supported by two retaining walls, the whole being covered with cairn material supported by a third wall, standing on a raised platform. Sherds of Neolithic pottery found on the floor show affinity with the Rinyo (HY43SW 20) and Skara Brae (HY21NW 12) settlements; while a slate disc found in the chamber is comparable with finds in western Scotland, Wales, Spain and Portugal. Childe envisaged the complete cairn as a domical mound like Maes-Howe (HY31SW 1) and it must have stood at least 14' high. MoW have exposed the upper part of the innermost encircling wall, and short sections of the two outer walls on either side of the passage. The outer half of the passage is without lintels so that the sides above the original wall-head have been faced with walling up to the level of the cairn surface, and the present entrance is by modern steps through the outermost wall. 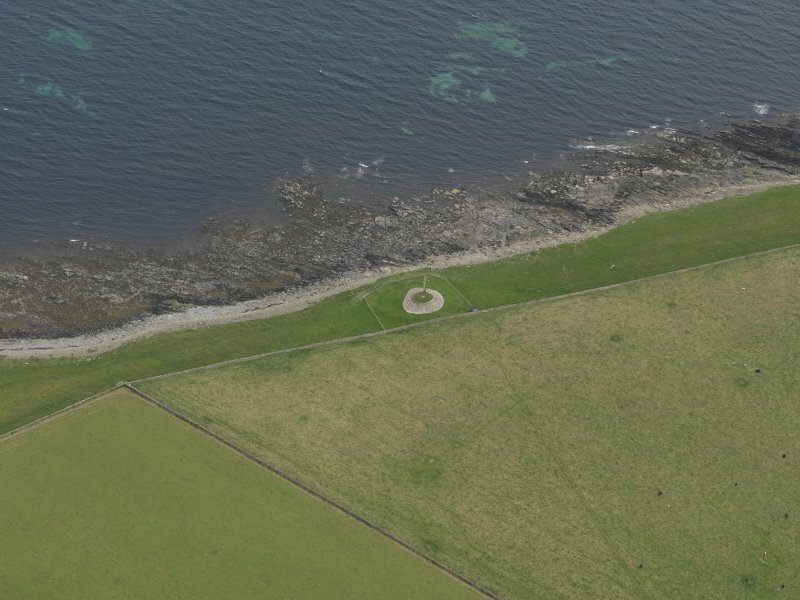 According to the NSA the name 'Augmond's (or as it is locally pronounced, Egmund's) Howe' applied to the neighbouring site (HY63NE 3) properly applies to this cairn. New Statistical Account (NSA) 1845; J Farrer 1870; J Anderson 1886; RCAHMS 1946, visited 1928 and 1935; V G Childe 1954; A S Henshall 1963; R W Feachem 1963. 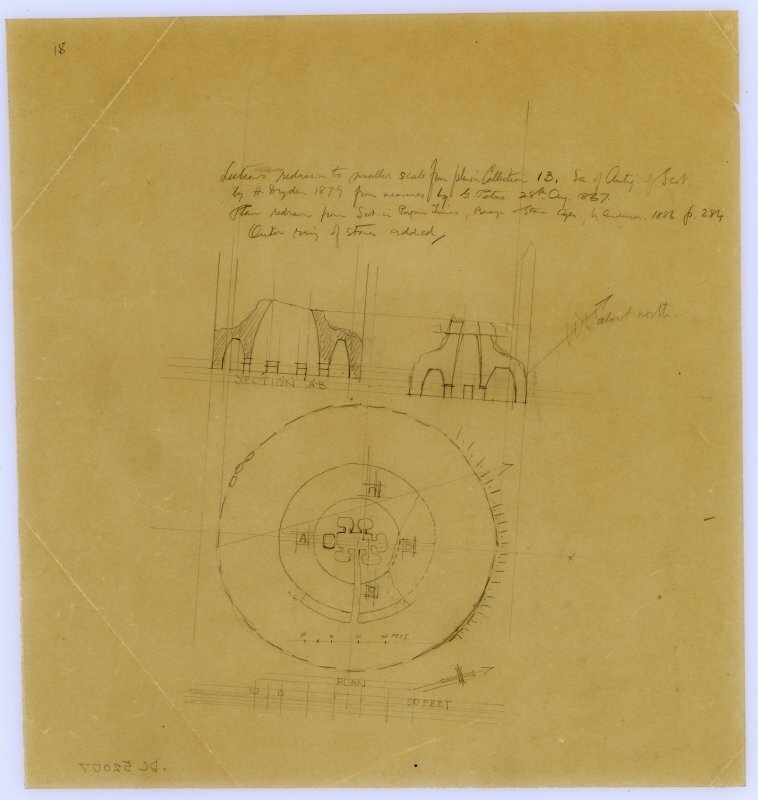 A chambered cairn as described and planned by Henshall. Neither the name Quoyness Brough or Augmund Howe is known locally. Visited by OS (NKB) 6 July 1970. 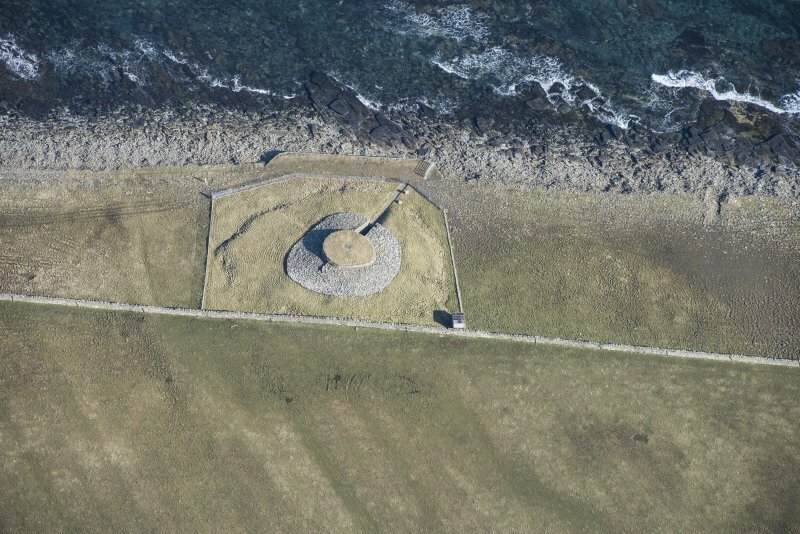 Scheduled as Quoyness, chambered cairn, Els Ness, Sanday. Information from Historic Scotland, scheduling document dated 25 April 1994. Following his visit to the site, Childe convinces the landowner, Mr Irvine of Elsness Farm to place the monument under guardianship. Childe supervised preparatory excavations by the Ministry of Works between July and August 1951. Following a season's excavations in 1951, Childe returned in 1952 for 3 weeks to investigate features uncovered in the previous season. The location of Quoyness is very similar to that of Holm of Papa West ray South (no. 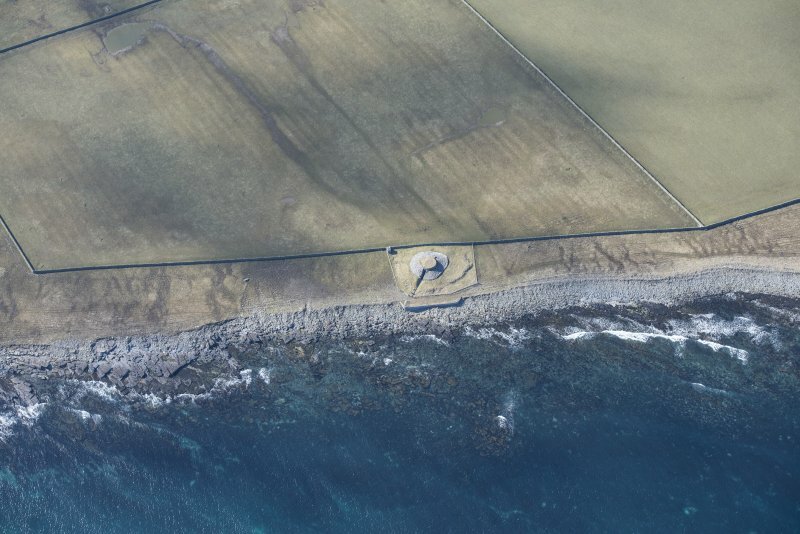 77), on an isolated peninsula, except that Eis Ness, unlike the Holm of Papay, is still, just, connected to the adjacent mainland. Both are outstanding examples of Maes Howe type tombs. 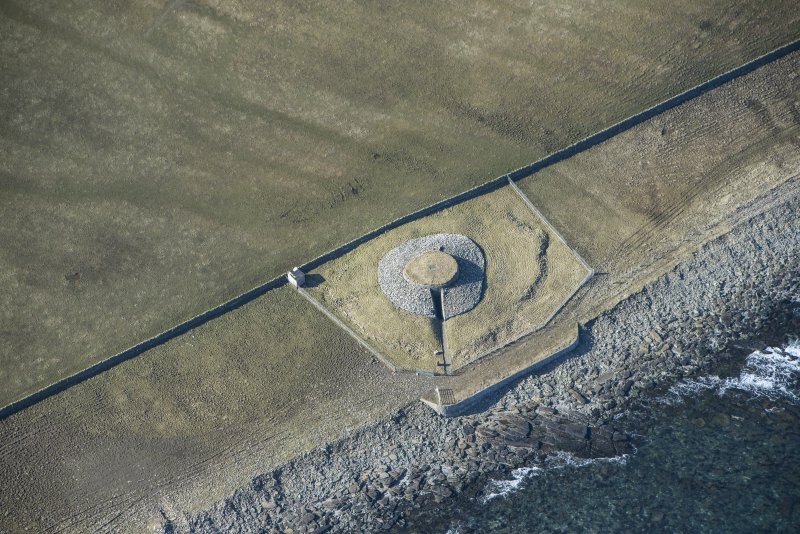 Although lacking its original roof, the chamber stands intact to its full height of 4m, and consequently the external appearance of the cairn is also very impressive, the more so as it stands on an artificial platform. 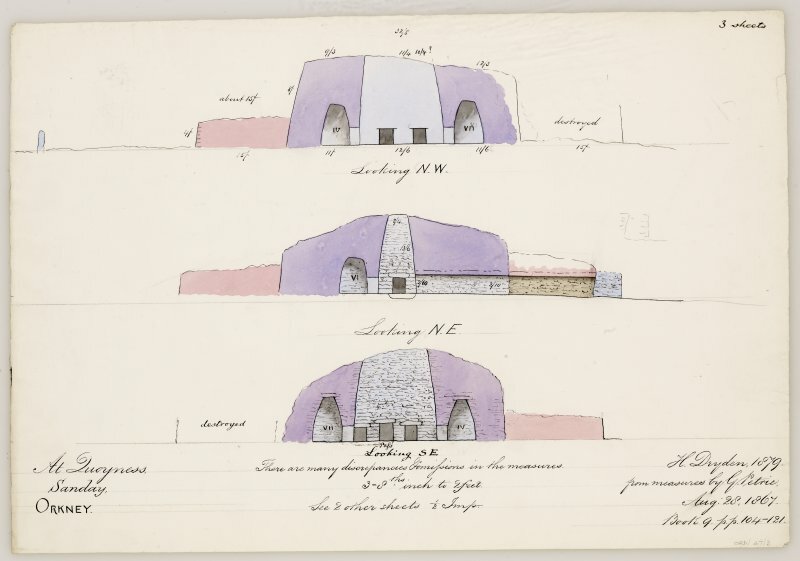 Three consecutive wall-faces can be seen, representing the inner cairn round the chamber, a middle revetment flush with the outer end of the entrance-passage and an outer casing. Originally the entrancepassage was roofed for its full length of 9m, but only the inner 3.5m is now intact and roofed at a height of 0.6m - the complete 9m crawl must have been a daunting experience! Emerging on hands and knees, the chamber seems vast and soaring skywards. 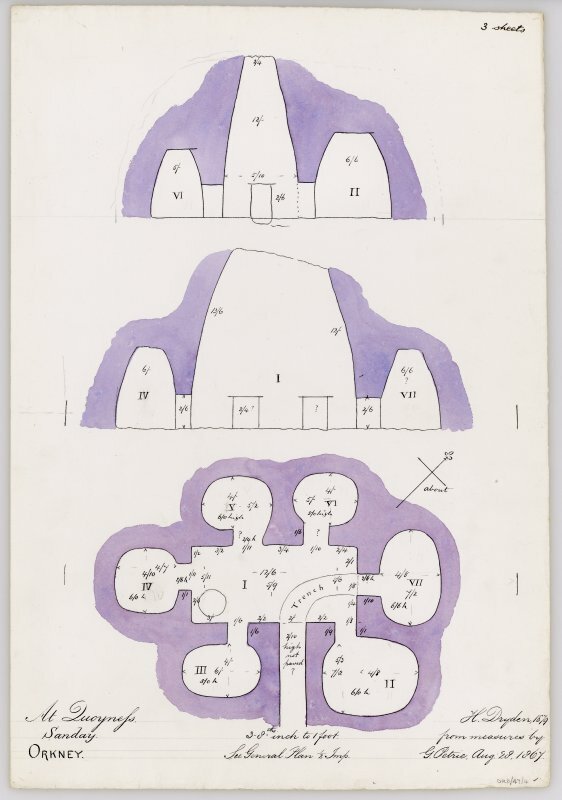 Low entrances open into six side-cells, all but two of which contained burials, and there were further burials in a cist sunk into a pit in the southern corner of the chamber. Unfortunately this was a depressingly bad 19th-century excavation in which an enormous amount of archaeological information was lost. Objects found in and around the tomb included bone and stone implements similar to examples from the contemporary settlement as Skara Brae (no. 61), and it is likely that the tomb was built very early in the 3rd millennium BC. 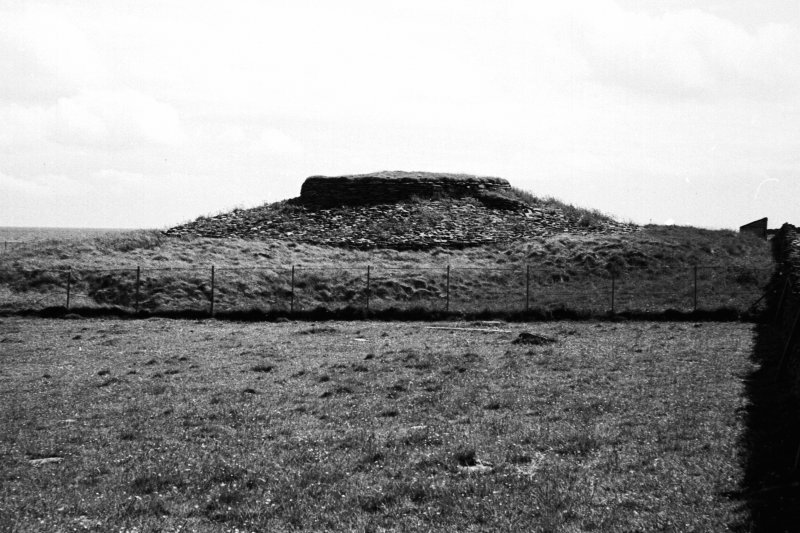 The wrecked but still impressive mound nearby to the south may well have been another chambered tomb, traditionally known as Egmondshowe (HY 676375); it is enclosed by an arc of eleven small bronze-age burial mounds connected by a bank. At least another twenty-six small cairns are scattered over the peninsula, implying its continuing sanctity as a burial place throughout the 2nd millennium BC. The excavation of Tofts Ness (no. 60) has shown, however, that sometimes such cairns are the result of domestic rather than funerary use. 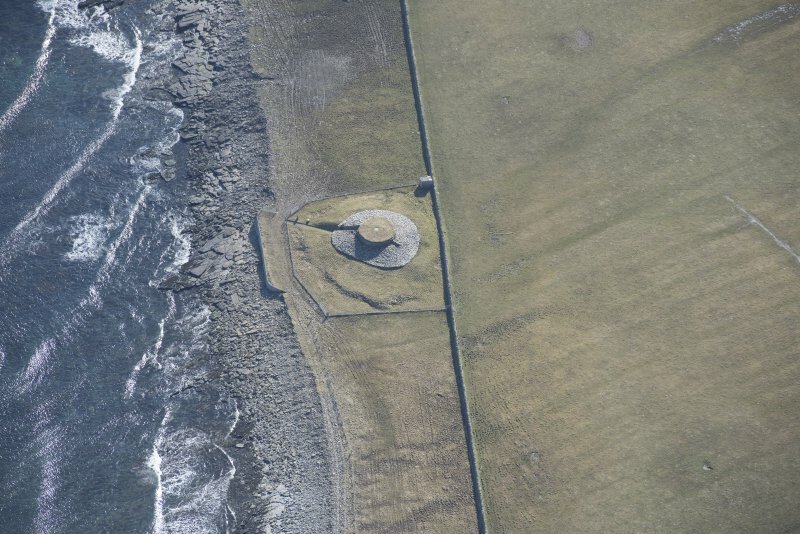 his Maes Howe type chambered cairn forms a prominent feature on the low-lying peninsula of Els Ness. It was investigated by Farrer and Petrie in the 1860's with subsequent salvage excavations carried out by Childe in the 1950's. 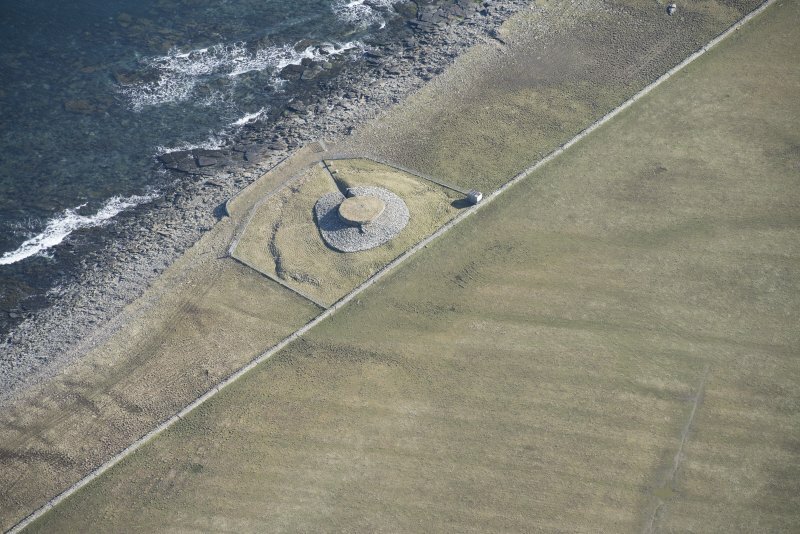 The cairn measures 20.5m by 17m and stands on an artificial platform. A 9m entrance passage leads into the central chamber. This stands 4m high and has six symmetrically-arranged side cells opening off of it. Sherds of Neolithic pottery, animal bone and stone implements were uncovered, along with a quantity of human remains. The tomb has been consolidated and partially restored and is open to the public under guardianship protection. Ref. 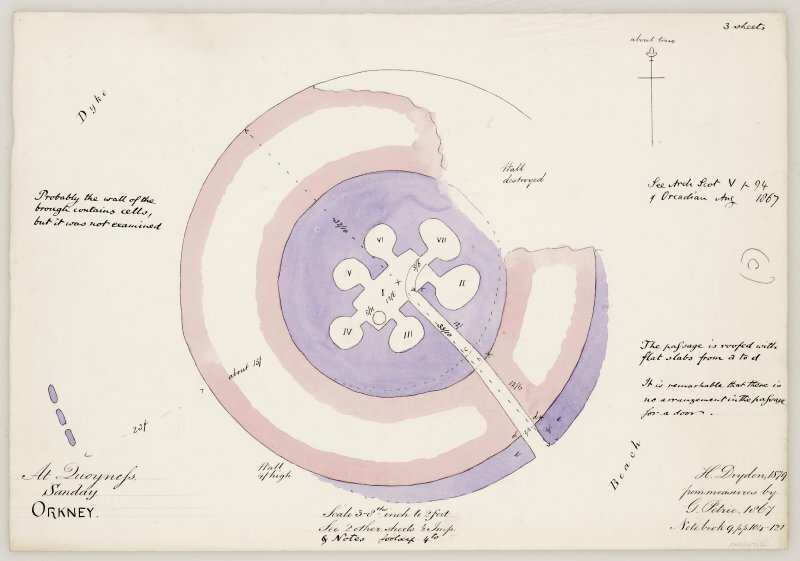 : Farrer, J (1870) 'Note of excavations in Sanday...', PSAS, 7 (1866-8), 398-401; RCAHMS (1946) #449; Childe, V G (1954) 'Re-excavation of the chambered cairn of Quoyness, Sanday on behalf of MoW in 1951-2' in PSAS, 86 (1951-2), 121-39; RCAHMS (1980) #3; Davidson, J L & Henshall A S (1989) 'The chambered cairns of Orkney', #44.
cultivation, and has given the name Quoyness to this building'. been converted into a tomb. [R2], cuttings in NMR ref SAS 397, [R3]. collection]. NMR SAS, Petrie notebook no 9, in RMS.